A cappella groups turn on the charm for potential new members. Click here to view more photos of the 2012 Woolsey Jam. Every fall, at the Woolsey Hall Kick-Off Jam, Yale’s 15 leading undergraduate a cappella groups strut their best stuff, trying to recruit top singers. Creative choreography was on display at this year’s August 26 jam, including a lot of Glee-inspired clapping and foot stomping. 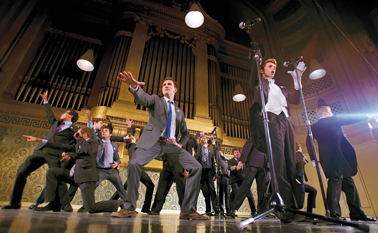 The Duke’s Men (shown here) performed their version of Rihanna’s “Umbrella”—an audience favorite for its “full-blown choreography,” according to Michael Blume ’13 (left foreground).